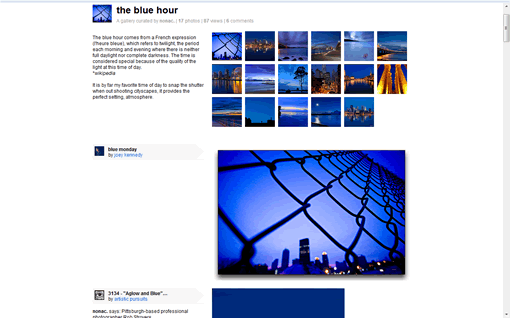 Flickr introduced a new feature today called Galleries. Galleries are different from sets and collections you use in Flickr. While sets and collections belongs to your photos with Galleries you can display your friends photos or any Flickr members photos as a set called a Gallery. Flickr team terms Galleries as â€œFavorites on steroidsâ€, you can add any picture you find interesting on Flickr to a gallery, Galleries can be based on a theme. You can add photos and videos to galleries, and only 18 items are allowed to feature in a gallery. To add a picture to gallery, see for Add to Gallery button on photo menu found above the photo. If you donâ€™t see this button may be the user who uploaded the photo doesnâ€™t allow it.